After months of being dethroned, last month saw LadyJava reclaiming her throne here at Wishing on a Falling Star! LJ beat Monica to the finish line by a mere 1 comment so it was a close contest. Congrats LJ and to the rest who made it to my August Top 10 Mariucans list. Thank you very much for all your comment love and I enjoyed reading and replying your many interesting comments! 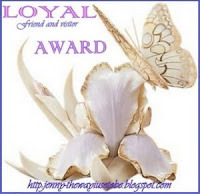 In appreciation of your continued loyalty to my blog, please accept this Loyalty Award from me. I received this award from Bing and now I'm so pleased to present it to my Top 10 Mariucans in August. Congratulations LJ!! wuaah claim throne again!! That's awesome, LJ!! :) With all her work and all that, she still managed to do it. I don't know how you guys do EVERYTHING!! LOL! Thank you marzie!! out of the blue it seems.. i didnt want to go online.. but since i have to re-wake up J who sambung tidur on the couch.. i can't go to sleep. so here i am.. chopping away!! LOL! morning mon!! haven't slept yet?? morning Shemah! oh i woke up a few hours ago, after 11 hours of sleep! LOL! I’m feeling a little sleepy now Mon hohoho…. for some reason I'm having a hard time submitting comments. Thanks Elai, congrats to you too of coz! You made the list Elai, woo hoo! Thanks Bill for all your comments here too, have a great day! I was watching my sitcom Mon…must keep things light n easy early in the morn LOL! I think I can go for 9 hours Ayie but 11 hours... I’ve yet to experience that lol! Sorry I had to change satellites!! You always listen light and easy is it? Free and easy becomes lite and easy pulak! Hahaha! When I saw your comments on my blog regarding lite and easy, I could not stop laughing! haha! Actually we didn't follow tour for my 10 days trip in China. But only made use of the tour company for a few places because it's cheaper than going on our own to these places. Sorry, I haven't been able to return your comments more often. I'll try my best. Thanks for your patience, understanding and for being such a great pal! I got ur buzz2 in my inbox late la Foong, dunno why… stupid screamyx lol…everything oso blame on them ha ha! Dat’s why la….. lucky I realized my blunder hahahaha! I do listen to light n easy Foong but I think I was still excited after voting for MC at Mix…so light n easy, mix, hitz…all still on my mind that time I commented at ur blog LOL!!! LOL!! Sure can be in my Top 10 this month Foong, wahhhhh currently number 3 edi! I can't believe I allowed this to happen!!! Waaaaatching u climb back Ane, kamon Ane! Try to make my list this month sweetie! Looks like it Ane huhuhu! Hey ECL! Lovely to see u here today! Thank you for all ur comment love last month sweetie, see u again in Sept? Not bad at all Tekkaus! Aiyoooo dat’s why la, I saw Mauricians only terus I LOL by myself hehehhe! and i'm one of the Mauricians hhahahahah! Hahahah tu la, sorry u have to be one of the MAU-ricians Mon hahha!!! Love ya!